Mealtimes! A word that can evoke a mixture of emotions for Parents. Supporting your child to have a healthy relationship with food takes time and patience. Here are our top tips in ideas to make mealtimes fun and to help your child have a positive attitude towards food and become excited about mealtimes. Life is busy, but try to prioritise having mealtimes together around the table as much as possible. Not only will your child be exposed to the types of food you are eating, it is also a great time to socialise with each other. For young children they will enjoy being with you, for older children it is a chance to share things about your day. Try encouraging social conversations with questions like ‘what’s the best thing that happened today?’ Encourage everyone to take a turn with sharing so that one person doesn’t feel put on the spot. Allow your child to have an inquisitive mind towards food whilst they are learning about it. You can do this by allowing your child to learn about the properties of the food by experimenting when helping to prepare it and when it is on their plate. What happens when you cut it? What happens when you squash it? Can you mould it or snap it? Is it dry or wet to touch? Crunchy or soft when you chew it? All of this experimenting is learning for your child and helps to raise their comfort levels with the food, ensuring they are ready to taste it. Involve your child in the cooking process and in the kitchen as much as possible so they can learn about food and the process of how it gets to the table. Involve them in the food shopping by having a list of items to collect. Involve them in the kitchen with simple jobs to do. 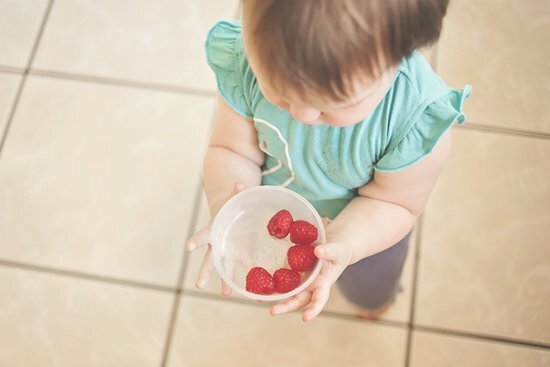 Even small children can help out with simple jobs like fetching things from the fridge, washing food, mixing food in a bowl or wiping a surface. It also gives the opportunity to introduce new words to them like ‘whisk’, ‘pour’, ‘mash’, ‘stir’. Involve them with setting the table and putting things into the bin at the end of the meal. This also gives a clear signal that the mealtime has finished and it is time to leave the table. Children learn by watching others so be a role model to your child. Show your child how you would like them to behave around food by eating at the table (even if it’s a small snack) at the same time as them. Encourage your child to become more independent around food by offering them simple choices of foods to choose from and providing opportunities for them to feed themselves at the table, even if that means that things gets abit messy! Mealtimes can be stressful, work as a team with your child to make the dinner table, picnic blanket and kitchen bench a fun and interactive place in which to explore and learn about food in to foster a healthy and positive relationship with food.